The best known camellia is tea (Camellia sinensis). Grown in China for more than 4000 years, it was taken to Japan in the 7th century AD but did not make it to Europe until 1610, when Dutch traders took green tea home. ‘Dream Girl’, an early flowering C. reticulata hybrid. Initially marketed for its medicinal qualities, the new drink caught on to the extent that it vied with coffee as the world’s most popular drink, particularly after tea plantations were established in India and Ceylon (now Sri Lanka) from the late 1830s. Tea can be grown in New Zealand: Zealong Tea plantation on the outskirts of Hamilton produces high-end tea and some was grown in the Motueka area until the late 1990s, but without success. Leaving aside the popular drink, it was not until 1792, when C. japonica ‘Alba Plena’ and ‘Variegata’ reached Europe that interest was sparked in camellias as garden plants. Camellia lovers will tell you these evergreen shrubs are unbeatable not only for flowers but for glossy leaves that look good even in hot summer weather. With a flowering period from March to November, depending on the variety, they are adaptable enough to be used for hedging, standards and even bonsai, as well showing their virtues in a shrubbery. The only drawback for some gardeners is the rather limited colour range of red, white and pink, although there are some attractive blotched and striped cultivars, and lemon-yellow varieties (‘Jury’s Yellow’, Gwenneth Morey’, ‘Brushfield’s Yellow’). Of the bright yellow-flowered species, C. nitidissima (syn. C. chrysantha) is one of only two gardeners are likely to see in New Zealand and then only in the warmest parts of the country. The other, C. impressinervis, has softer yellow flowers. C. transnokoensis – whose appeal is its somewhat drooping habit and masses of small flowers – and slow-growing C. tsaii, which can reach 10m at maturity. Cultivated varieties fall into three main groups, sasanquas, japonicas and reticulatas. Sasanquas start flowering in early autumn. The blooms may be single or double and white, pink or (less often) red and not as showy as the blowsy reticulatas that appear in spring. Two other species, C. hiemalis and C. vernalis, that have similar characteristics are sometimes sold as C. sasanqua. To cause further confusion, hybrids between sasanquas and reticulatas have been produced to combine the former’s early flowering with the latter’s large blooms. Popular among these are “the girls”, ‘Show Girl’, ‘Dream Girl’ and ‘Flower Girl’, bred in the United States in the 1960s. Sasanquas are able to be grown in sunnier situations than most other types and put up with windier conditions, so lend themselves well to being grown as hedges (‘Plantation Pink’ and ‘Gay Sue’ are deservedly popular) or as espaliers. They also make good bonsai subjects (try ‘Yoi-machi’ to train in a cascading form) and smaller varieties do well in containers, as long as they are given plenty of water and repotted every second or third year. Next up are the reticulatas, from southern China. They have large (some say blowsy) flowers and big, leathery leaves. In warmer parts of New Zealand, they start flowering in May. The shrubs are taller than most other camellias and lend themselves well to being trunked up for underplanting with the likes of hellebores. Of the tens of thousands of cultivars, the majority are descendants of C. japonica which, despite its name, is endemic to China, Korea, Taiwan and Japan. ‘Takanini’ is one of the best reds. An important hybrid is Camellia x williamsii, resulting from crosses of C. japonica and C. saluenensis. First bred at Caerhays Castle in Cornwall by John Charles Williams, the best-known are New Zealand-bred ‘Debbie’ and ‘Anticipation’, ‘Donation’, while ‘Les Jury’ is an excellent red variety named for the man who bred it in Taranaki. ‘Jury’s Yellow’, also bred by Les Jury, resulted from crossing a C. saluenensis and C. japonica hybrid with lemon-yellow ‘Gwenneth Morey’. To appreciate the beauty of camellias, two public gardens have internationally rated camellia collections. One is at the Auckland Botanic Gardens in Manurewa, worth visiting from July, while the other is the Dunedin Botanic Garden where the camellias are at their peak in September. Eden Gardens in Auckland also has a very good selection of camellias, while Tikorangi The Jury Garden has a fine collection in a garden of historic significance. C. x pitardii ‘Gay Pixie’. Although sasanquas and other early flowering camellias seem unaffected, petal blight (Ciborinia camelliae) is a devastating disease first seen in New Zealand about 20 years ago. It seems to strike only from mid-winter, starting as a brown mark that rapidly covers the entire flower. Botrytis is similar but less rampant. If camellia leaves, especially older ones, are yellow with green veins, your plantneeds more water or fertiliser, or perhaps lacks iron or magnesium. Apply a general granulated camellia fertiliser and water it in well. Sulphate of iron or Epsom salts may also be used. Root rot is caused by a fungus that flourishes in waterlogged soil, which is why good drainage is essential for camellias. Botrytis turns camellia flowers to a brown sludge, especially after wet weather. Because spores overwinter in the ground, don’t leave spent blooms on the ground. If your flowers have been badly affected by botrytis, do not compost them. 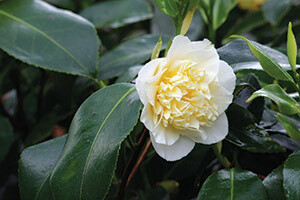 A few insect pests attack camellias. The most annoying is a leaf roller caterpillar, which always chooses to seal leaves over a flower bud then eats the tender bud. An occasional squirt of rose spray or soapy water will keep them at bay. Wherever you grow them, camellias must have soil that is slightly acidic (a pH of 6.0 to 6.5 is recommended), ideally rich in leaf mould and well-drained. Generally tough, they cannot cope with long periods of frozen ground, so for gardeners with these conditions in winter, growing camellias in large pots may be the answer. All camellias should be pruned as soon as they finish flowering. Old, “leggy” bushes can be cut to just above the ground to promote new growth that can be trimmed to a better shape. Cover large cuts with pruning paste. 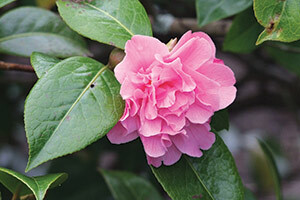 Fertilise after pruning and work in a handful of granules formulated for camellias around each plant. Water in well. Any camellia can be grown in a container. Over a period of about seven years, I moved a potted ‘Lovelight’ to four properties from Auckland to Invercargill before putting it into my Dunedin garden, where it grew rapidly into a splendid 3m specimen with masses of white flowers, larger than it produced previously. No more moves for that boy! What that does show is that camellias are very adaptable but you are pushing your luck to keep larger ones in containers on a long-term basis. Mine was pruned drastically to keep the size manageable but was repotted only once when it probably should have been done two or three times, along with some root pruning, to keep it in good health. If camellias are to be grown in pots, be aware that “small” in catalogues or on labels usually means flower size, not the plant. Look for compact or dwarf varieties, ideally those labelled as growing to 1.2m or less. 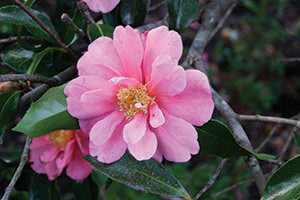 Camellias make first-class hedges for semi-shaded sites, although sansanquas are more tolerant of sun. Prepare the ground, fertilising well and add acid fertiliser if necessary to bring the pH to 6.0-6.5, the level recommended by the American Camellia Society.